This wooden lazy Susan was at the thrift shop this week. The tag was still on the bottom, and it was from Target. I thought the lazy Susan might be a good piece to try a new stencil I received compliments of Funky Junk Donna. Stencils make up-cycle projects so much easier and produce much more professional results. 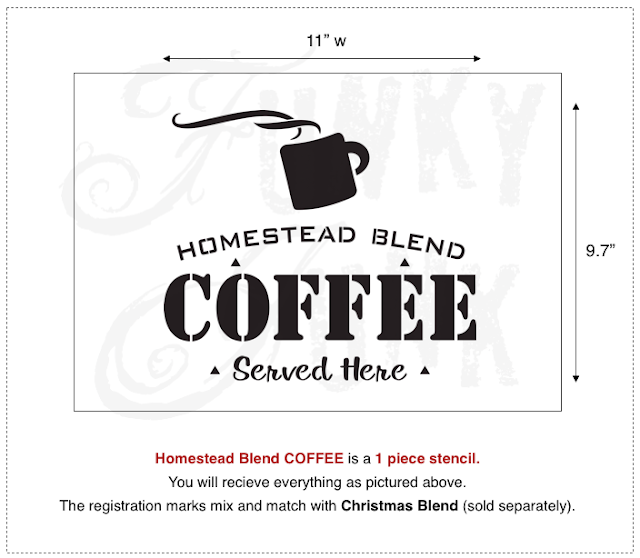 The Homestead Blend coffee stencil is especially good for square or round projects. 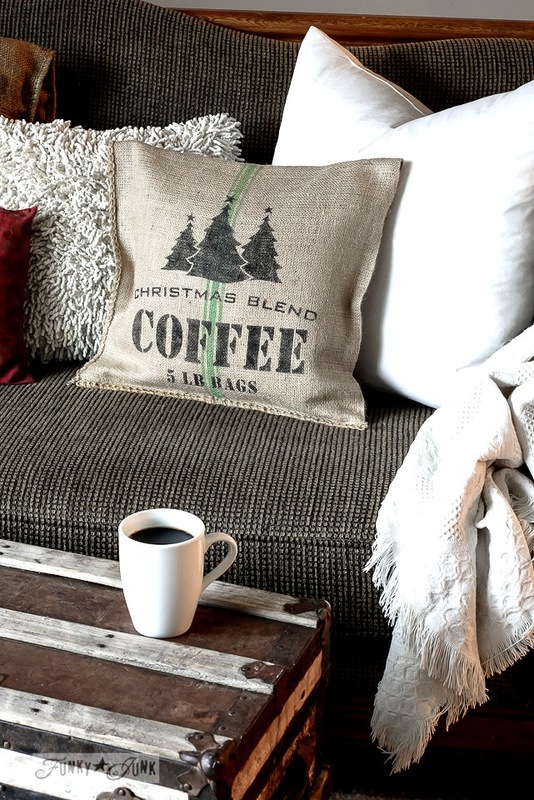 Here is a pillow stenciled with Old Sign Stencils. Click HERE to see more finished stencil projects or to purchase stencils. I painted my lazy Susan with 3 coats of DecoArt Chalky Paint in Lace. Then pounced on the Homestead Blend stencil with black acrylic craft paint. I used the sponge type pouncer for this project. I then distressed my lazy Susan with 220 grit sandpaper. Much more fun than the old brown stain! This is a recipe box I purchased in September at a garage sale. I guess I forgot to take a "before" photo. The recipe box had a very light stain and no varnish, so I gave it a coat of dark walnut stain. 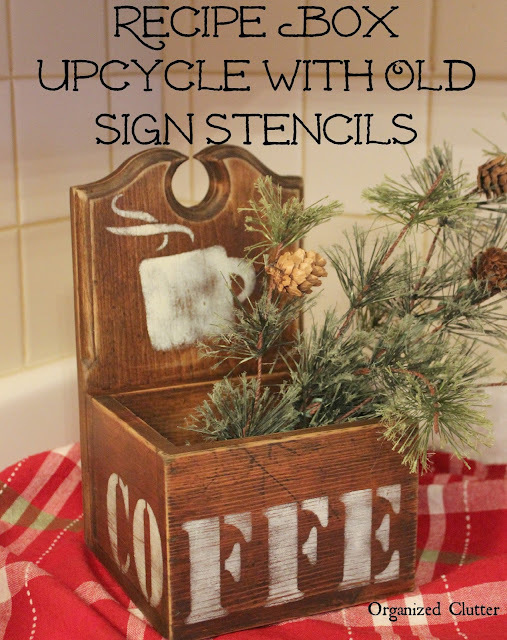 Then I stenciled on the word "coffee" from the Homestead Blend Stencil. I used a stencil bristle brush for this project. (The last E is on the other side of the box!) I also stenciled on the mug but the steam had to be modified to fit my box. I gave the stenciling and the edges a sanding with 220 grit on the stencils and 100 grit on the edges of the box to give it some age. My box can hold recipes, or greenery, coffee products, or whatever. I also distressed the cover. Stenciling can be addictive, just warning you! These projects are so inspiring, Carlene! I adore both the lazy susan and coffee container! Time to keep my eyes peeled at the thrift store next visit! I love these, Carlene. Great idea to wrap the COFFEE around the box. Great job and so much fun! Very cute projects! I also have a coffee lazy susan in my shop :) Nice work . Very nice Carlene ... really love Using the Lazy Susan this way. I need to do something like that to the one that I have. Maybe I could make a Hot Chocolate server with it. Time before Christmas is running short so had better hurry. I LOVE these!! I am going to have to buy that stencil. My kitchen is done in a coffe theme and I would have fun with this!! Thanks for sharing.